As a food processor, one of the most important choices you can make is what roofing system you trust to protect your processing plants. Roofing systems are the first line of defense against food contamination and equipment damage, two impacts with potentially devastating consequences. While businesses in many industries can afford minimal roof leaks for periods of time, the same is not true for companies that process food products. For critical food processing facilities, any leak (no matter how miniscule) occurring over even the shortest period of time is unacceptable. Any amount of food contamination caused by a leaking roof can be costly to your business’s reputation and, most importantly, the health and safety of your customers. 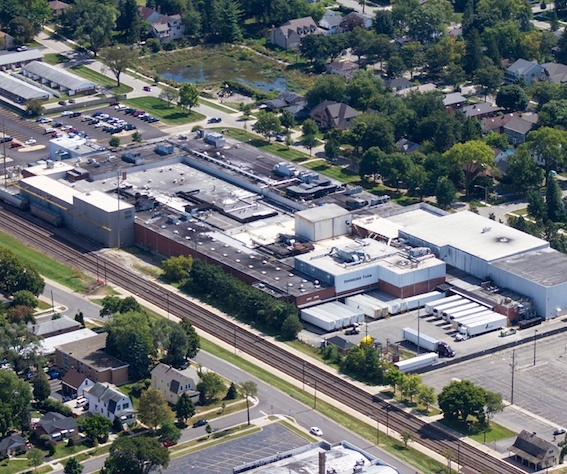 FiberTite Roofing Systems deliver consistent performance for challenging food processing applications. Some of the top companies in the industry rely on our roofing solutions, including Tyson® Foods, one of the world’s largest meat processors, and Spangler Candy Company, maker of the infamous Dum Dum® lollipop. Read about how FiberTite delivered a semi-custom solution to help Tyson Foods overcome a complex set of challenges, which resulted in the installation of 2 million square feet of FiberTite roofing systems on Tyson facilities. And find out why our nearly 20-year partnership with Spangler Candy Company has continued to strengthen over time. Many food processing companies have trusted FiberTite to protect their facilities for decades — in fact, some of our solutions have been safeguarding facilities since 1981. To learn more about how FiberTite protects food processing facilities, download our product brochure. Spangler Candy | 24 Installs Since 1998 Totaling Over 400k Sq. Ft.
Do you have a food processing roofing need to discuss?